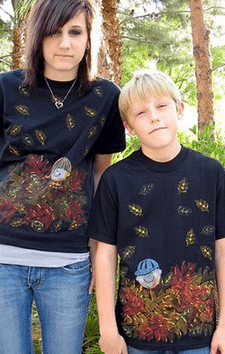 This adorable shirt, painted with a fall leaves motif, can be made for either a boy or a girl. So colorful and vibrant they are definitely going to love it, and easy to do with foam stamps and fabric paint. Go even further and add their name for a personalized touch. Hint: If using a black shirt like we did, some lighter colors will not show up as well as they would on a white shirt. You can use a paint brush to carefully touch up the face or hair if you like. Caring for your shirt: For the longest life of your design, we recommend washing inside out in cold water. Drying takes its toll on paint, so for the longest life, hang to dry. Amanda Formaro is the entrepreneurial mother of four children. She is also the Chief Editor and Craft Expert of FamilyCorner.com Magazine.